Do you consider yourself adventurous when it comes to food? Would you try new things that you’ve never had before? 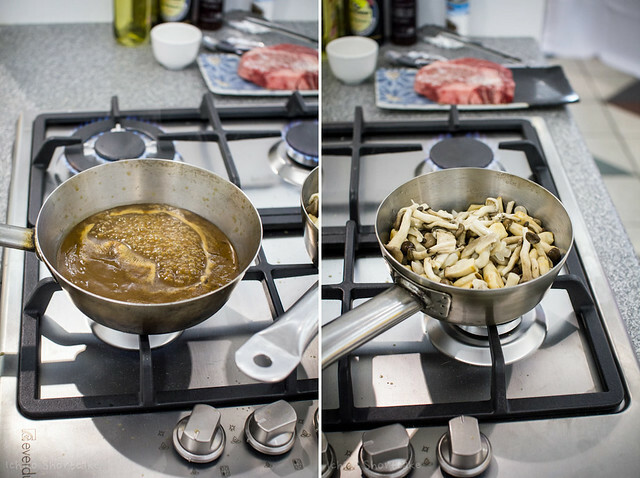 Are you interested in learning about seemingly strange ingredients and different cooking methods? 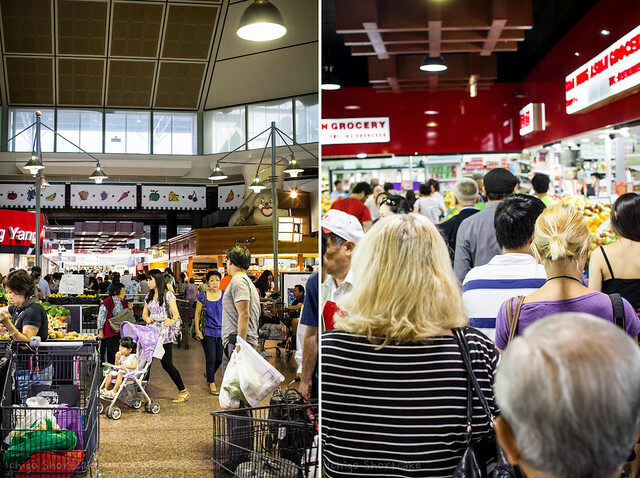 If you answered yes to these questions then the up coming Asian Garden Market Graze is the perfect thing for you. Some of you may already be aware that the annual Melbourne Food and Wine Festival has already begun (since yesterday). This year it runs from 1 to 17 March 2013 and is jam packed full of yummy and inspiring events for the food and wine lover. That’s over 200 events across Melbourne! 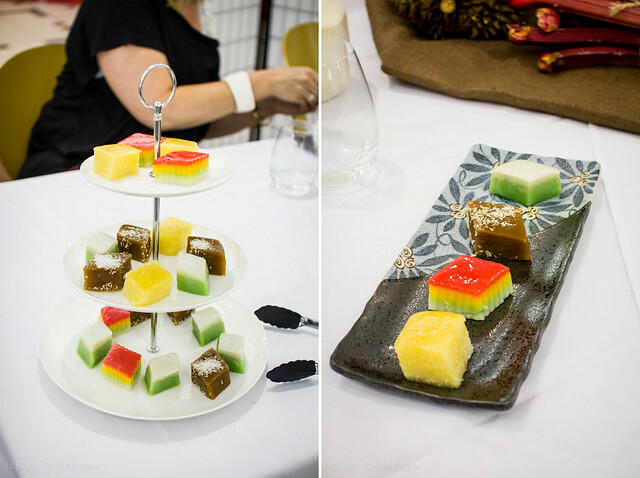 One event that I’m particularly excited about is the Asian Garden Market Graze which consists of a series of exclusive gourmet food tours through the Fresh Food Market at Centro Box Hill. 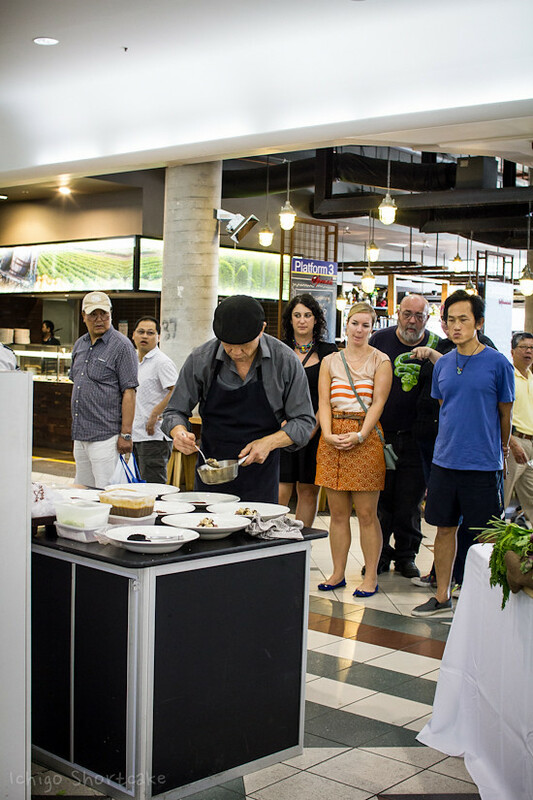 This tour is led by internationally acclaimed chef James Tan and is aimed to provide an introduction and insight into the weird and wonderful ingredients that form the foundation of Asian cuisine. 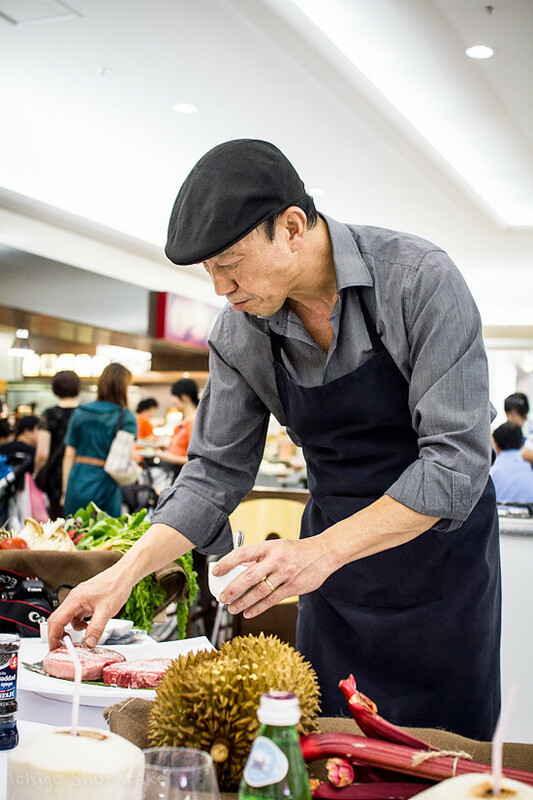 At the centre of Asian cuisine creativity is chef James Tan who had been studying and working extensively in Asia, Europe and Australia in the food industry for the past 35 years. 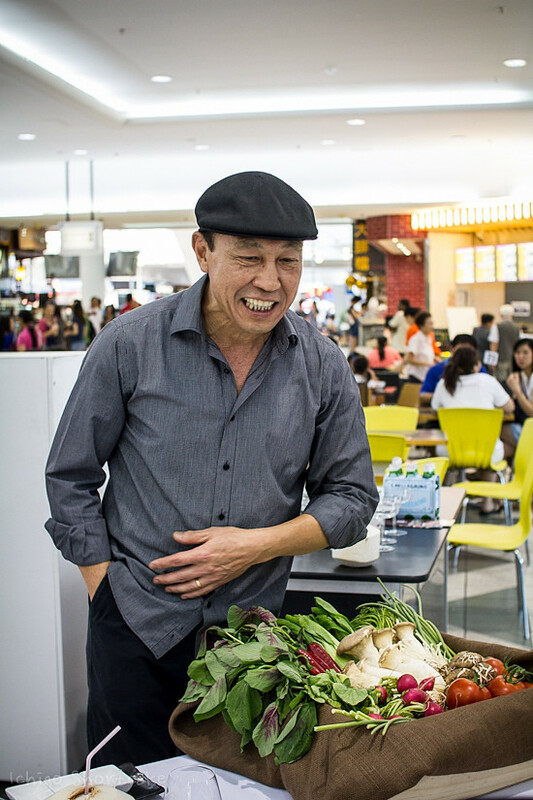 His deep knowledge and understanding of Asian cuisine has brought him many successes, including his award winning restaurant The Mandarin Duck, his one chefs hat Magic City Cafe in Camberwell amongst others. 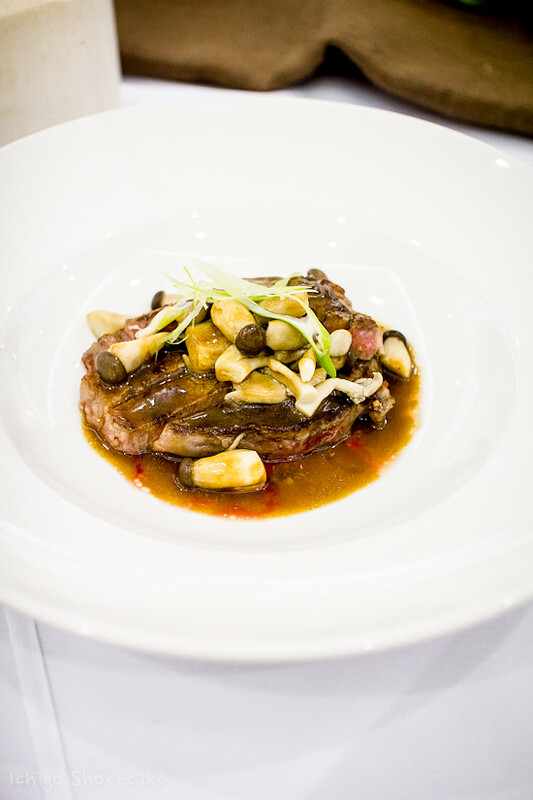 He has also worked closely with celebrity chefs on published cookbooks and shows as well as presenting to charity dinners and numerous Melbourne Food and Wine Festivals. With three generations of catering and hospitality industry roots and through his own hard work over the years, there is no better person than James to lead these series of food tours. Box Hill is located to the eastern side of Melbourne and can be considered a mini Asian town of its own. I still remember it was one of the first places that I went to with my parents when I was young but back then it wasn’t as populated and it definitely wasn’t as good as it is today for the foodophiles. 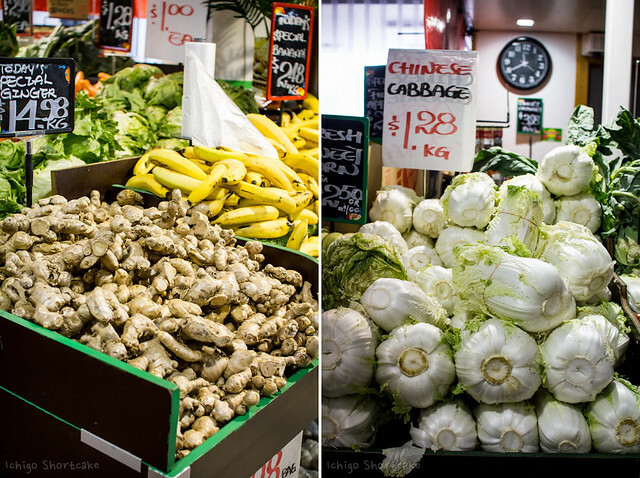 Centro Box Hill opened its doors in 1895 and consists of 2 buildings forming the shopping centre and houses one of the best fresh food markets you’ll find around especially when it comes to Asian cuisine. One of its success secrets is probably the convenience factor with the entrance to Box Hill Train Station directly inside the centre, many bus routes going past as well as a multilevel car park attached (free parking is available on weekends). 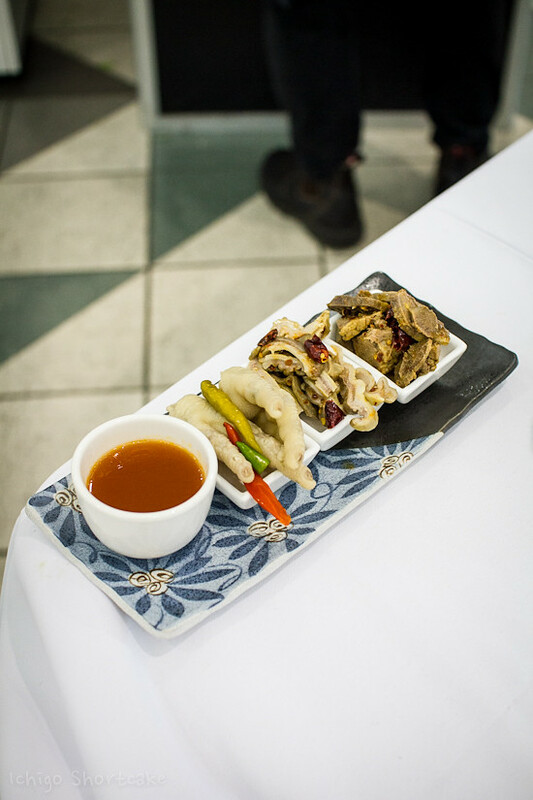 Myself and a few fellow bloggers were lucky enough to be invited to a sneak preview of the tour last Saturday with James as our guide and we even got to taste some of his freshly cooked dishes right in front of us. The base for our lunch was in none other than the middle of the busy food court. 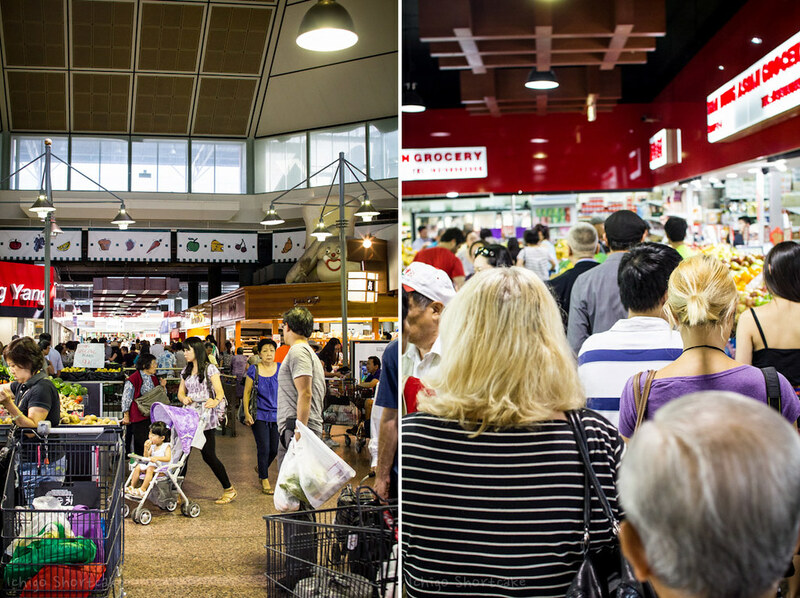 If you haven’t been to Centro Box Hill before, it’s like a mad house on a Saturday lunch time with people everywhere eating lunch, buying groceries and just hanging around. So you can imagine just how exhilarating it was to be exclusively seated at one of the white tablecloth lined tables eating with a fork and knife off pristine white crockery. Before the lunch began, James took us on his tour of the fresh food market, meeting the owners of some of the stores and hearing the stories that they had to share. According to James, roughly 20 million people come through the doors of Centro Box Hill a year, that probably makes it one of the busiest shopping centres in Melbourne I reckon. But as busy as the shopping centre gets with the comings and goings of all the customers, the owners of the stores themselves hardly changes hands. With so many shops next to each other, competition is fierce and is a perfect shopping destination for the price conscious. 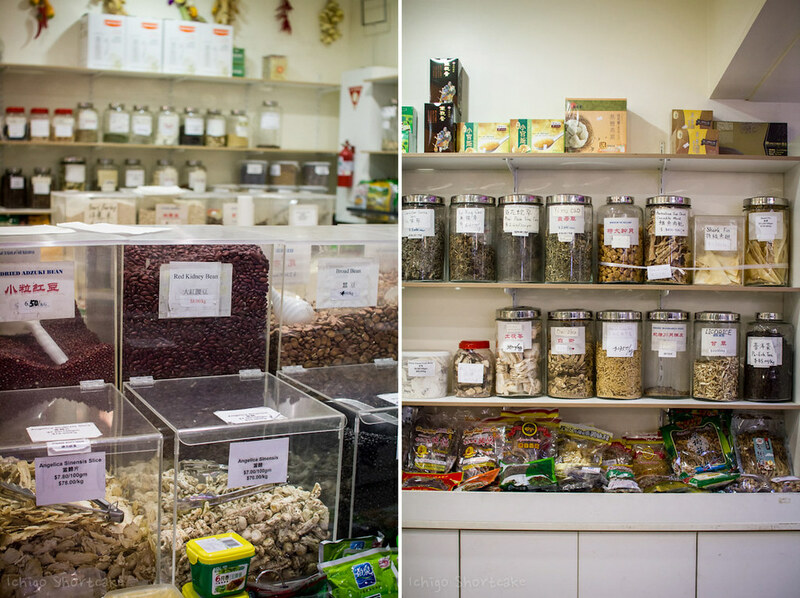 Our first stop was the Chinese herbal shop where we perused the many interesting ingredients that even I haven’t seen before. The shop owners are always happy to explain what certain ingredients are to you and of course there was James who was quite in the know about these strange ingredients. There are obviously ingredients here that I wouldn’t use in my cooking, it was still quite interesting to see the price tags attached and what they looked liked in their uncooked state. 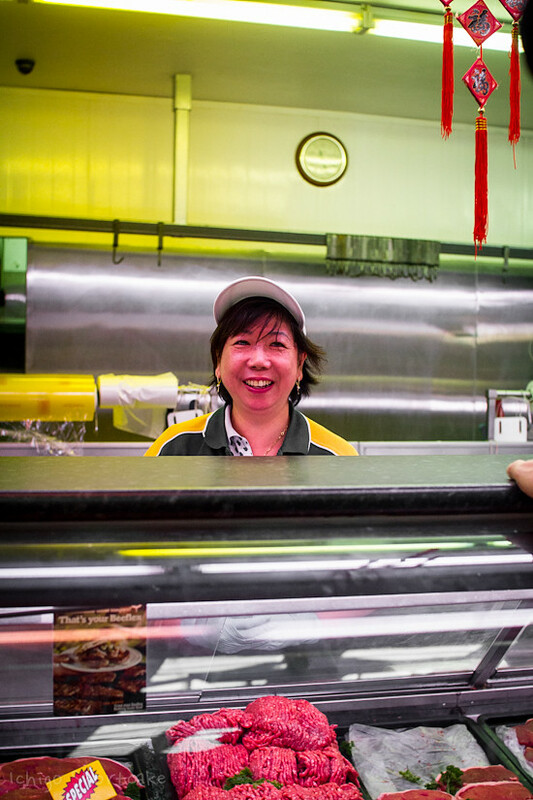 Our next stop was Central Meats where we met owner Yan who has been running the business for the past 8 years. They are a certified wagyu seller (Kobe beef) and the wagyu that we ate later on was from her shop (Yes! We ate wagyu…). 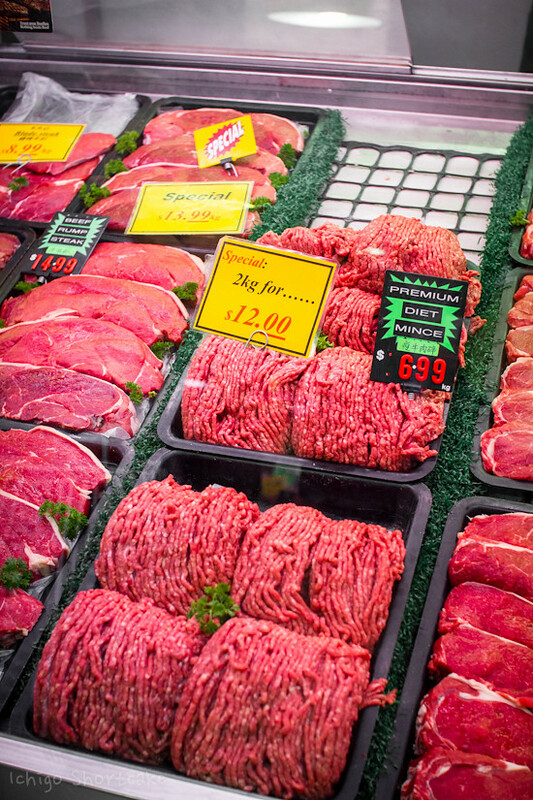 Their meats are fresh, competitively priced and stock a wide variety. 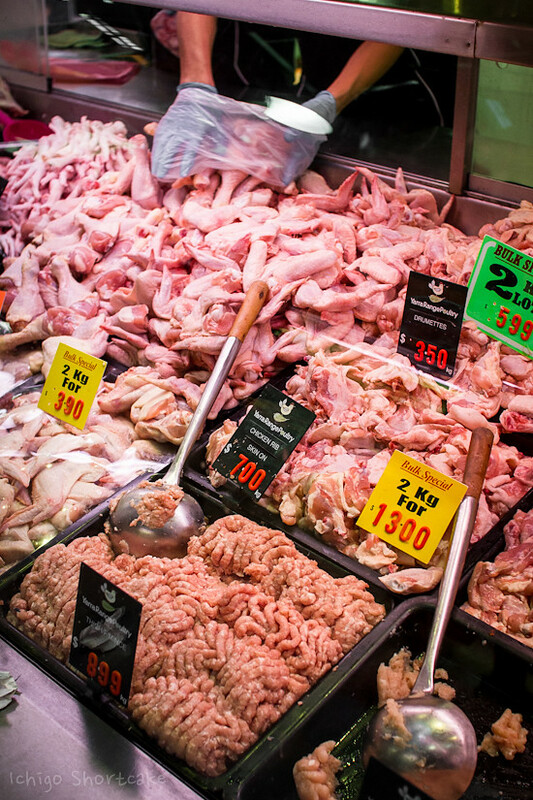 Yarra Range Poultry is situated directly across from Central Meats and obviously stocks your usual poultry needs as well as a few interesting varieties such as salted duck eggs, duck fat and frozen crocodile meat. Yes you read right! Mandy, the owner of Yarra Range Poultry is there to help with any questions you may have about the ingredients and if you need tips on how to cook them as well. 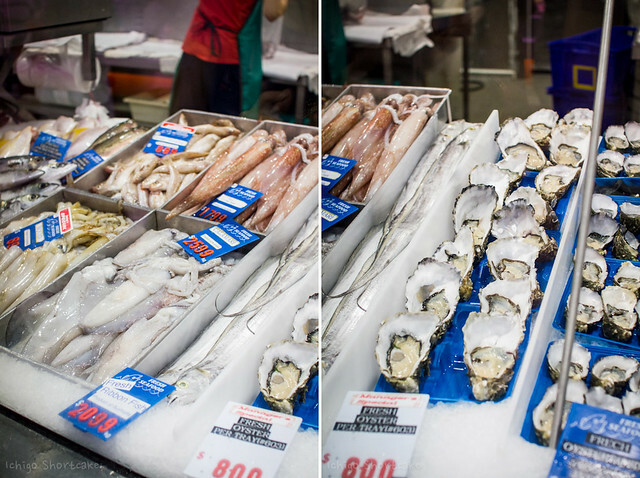 One of my favourites is the seafood shop because I love drooling over the shiny fresh fish and delicious oysters. 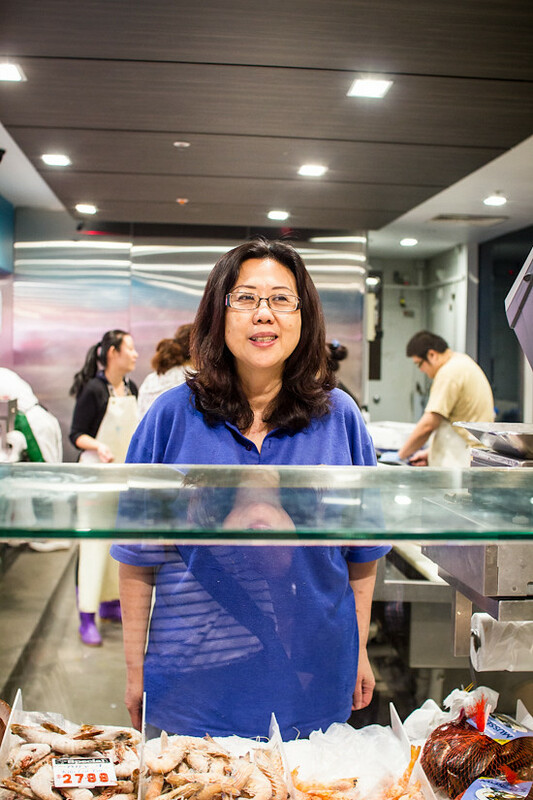 Elaine, the owner of Box Hill Fish Market, originally lived in Singapore, then America before finally settling in Australia. 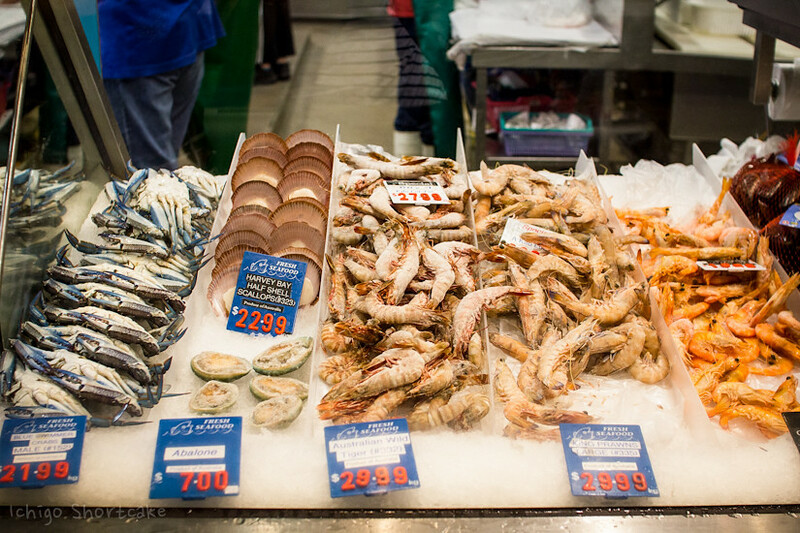 She has been in the seafood business for over 30 years in the different countries that she lived in so you can count on her for all your seafood needs. The lobsters that we ate for lunch were from her shop. 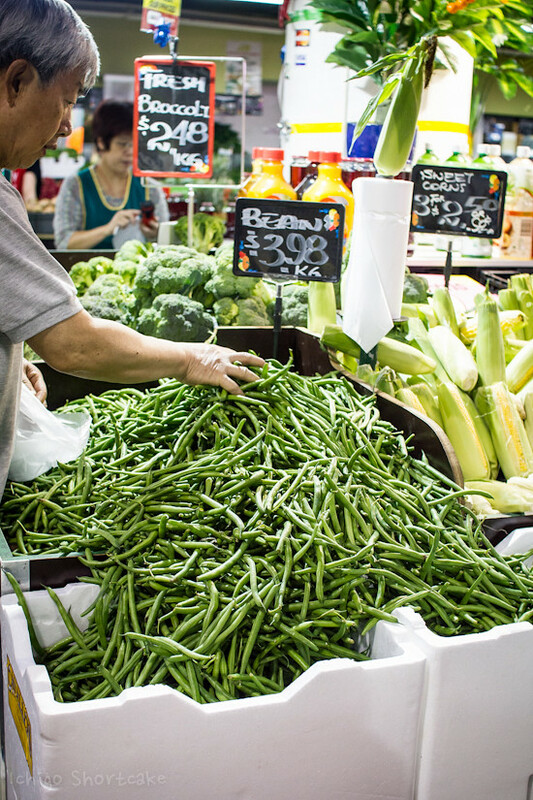 After passing the meat and seafood section, we came across the Asian grocery stores with their bright and fresh veggies and fruits. 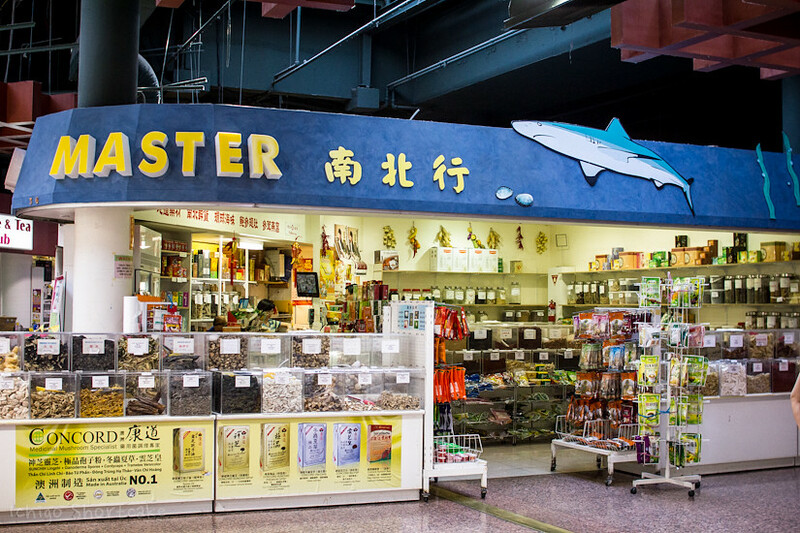 These shops are all family run and are obviously Asian focused so there will be ingredients here that you might not see in ordinary grocery shops. If you have a question about what ingredients go into a particular Asian dish or you’ve forgotten the name of a certain ingredient, don’t be afraid to ask the friendly owners! The market doesn’t just consist of fresh food shops as we saw. 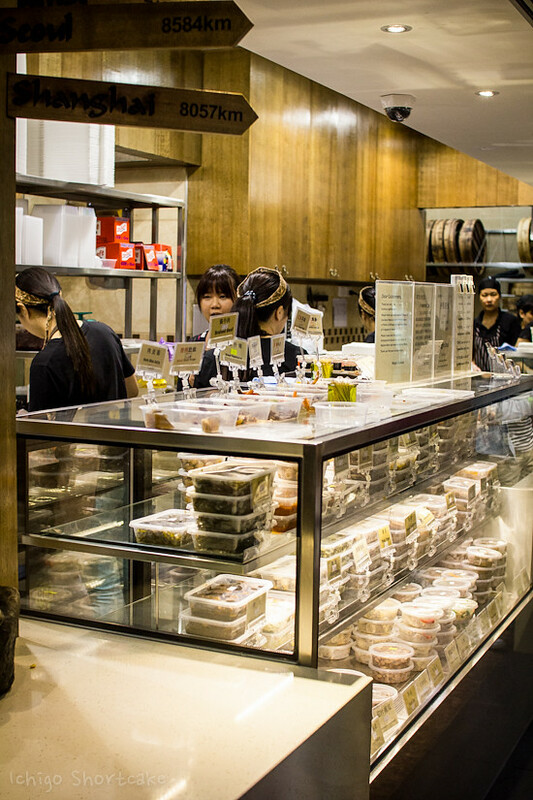 There’s also a myriad of restaurants, cake shops and cooked food outlets that sell pre-made goodies. 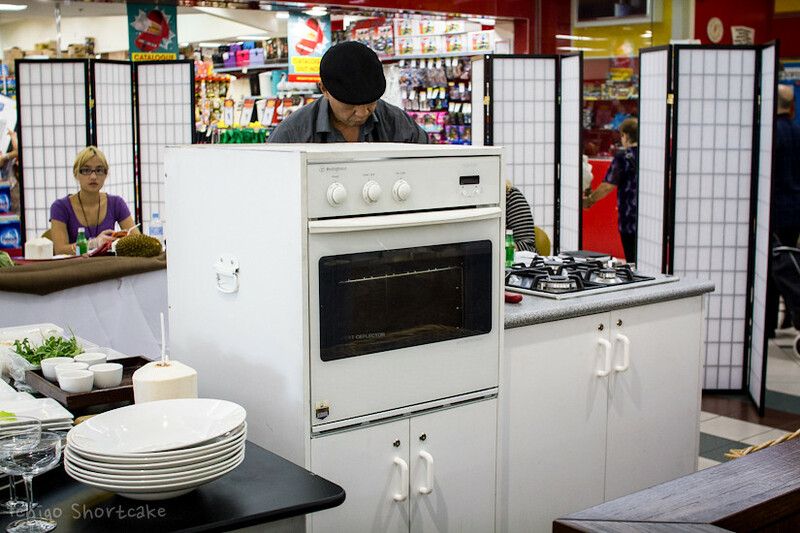 This shop called Magic Cuisine is a new addition to the centre. 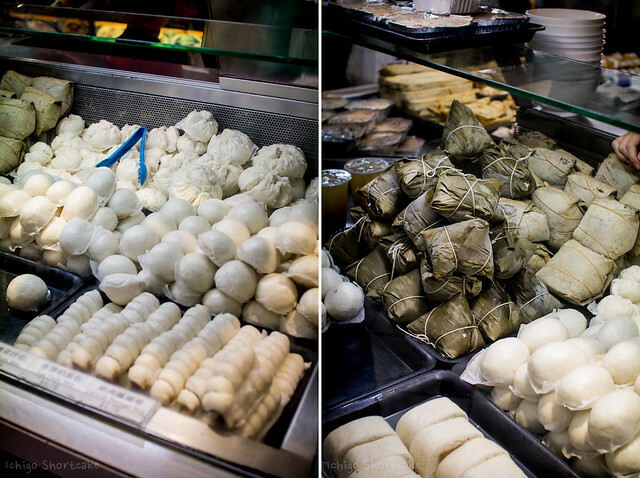 They sell pre-packaged Chinese delicacies that you eat cold or heated. Such stores are very popular in Asia due to the convenience and is picking up here as well. 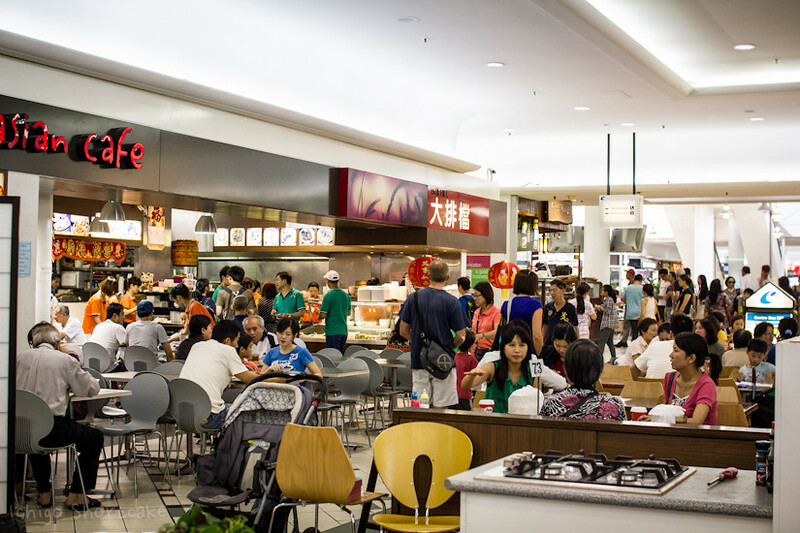 Cathy is the owner of Magic Cuisine as well as Pancake Village and Rainbow Chicken in the food court (below). 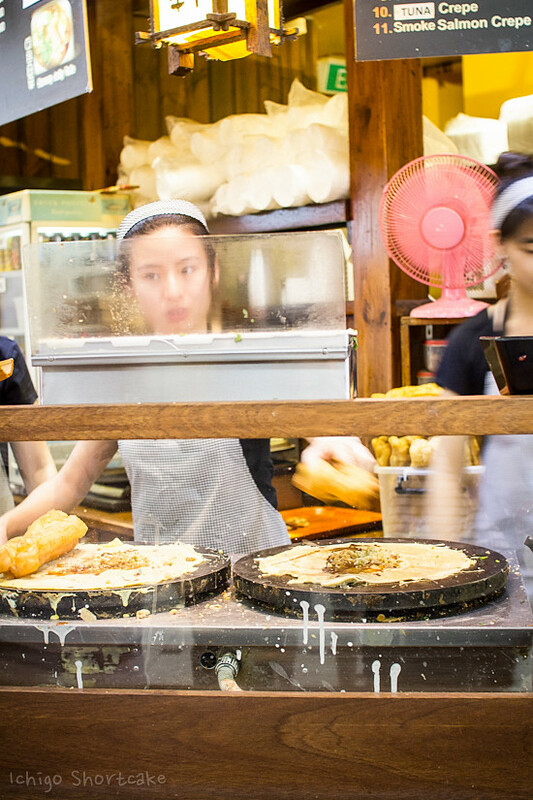 Pancake Village makes traditional Chinese pancakes with many fillings to choose from, it’s one of my favourite snacks to nibble on while I’m shopping in China. 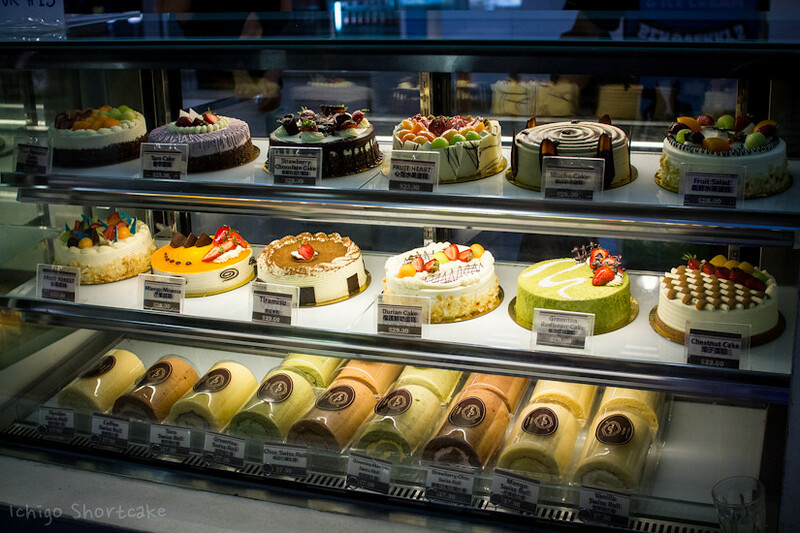 For all your cake needs, there’s no better place than Cake World. They also have another outlet in Glen Waverley which is our go to shop for all our birthday and special event cakes. Their cakes are fluffy and light and totally delicious. After an hour of walking around in the shopping centre, my stomach was starting to growl with hunger. It was time for our tasty lunch cooked by James! 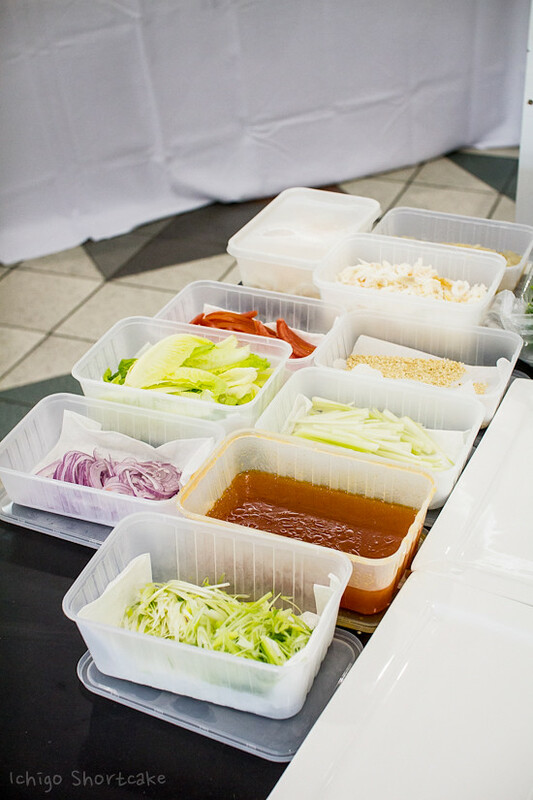 I loved the mobile kitchen setup in the middle of the food court which attracted a lot of attention from onlookers. 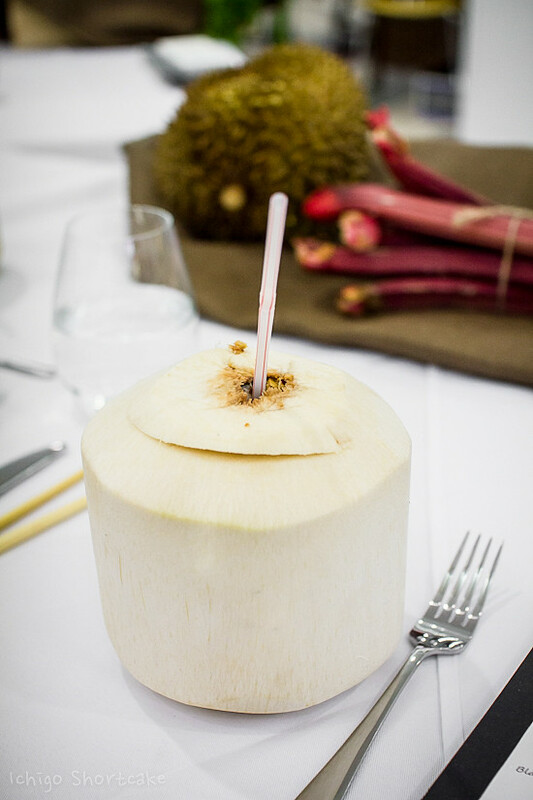 We were served delicious young coconut juice which was perfect for that day’s unbearable heat. 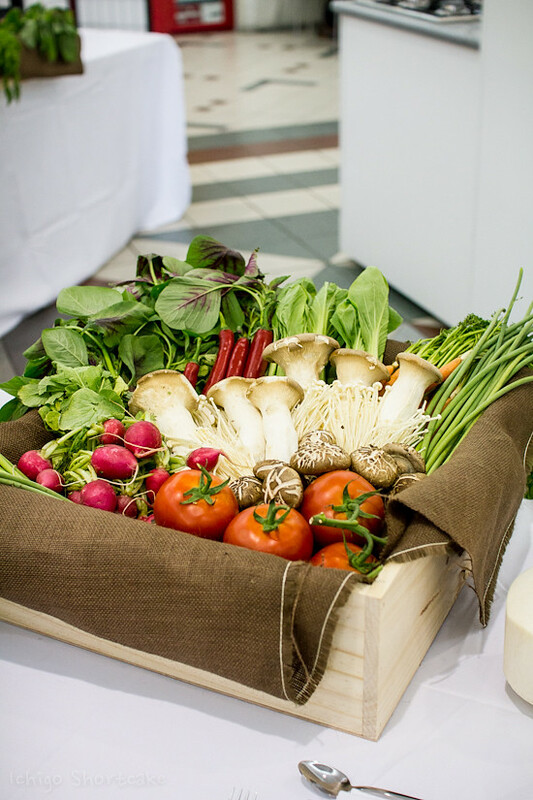 I also loved the table set up with fresh market produce to liven up the scene. 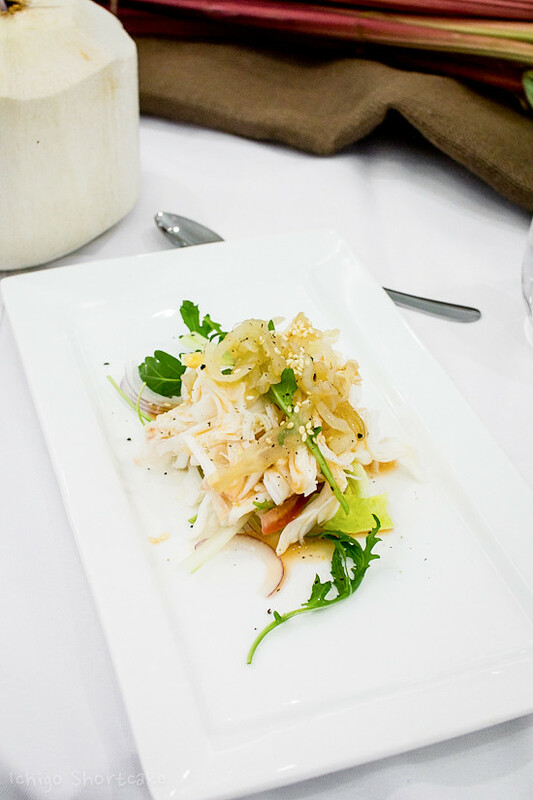 Our first dish for the day was the rock lobster and jellyfish salad with chilli, lime and palm sugar. One of the best things about this event was how we could watch the master in action and take photos of every angle possible. I was so engrossed in taking photos that I almost didn’t have time to eat! The preparation for the dishes were all done that morning and brought to the location. This dish was skillfully plated by James in front of us. I was originally a little skeptical about the dish. I love lobster and I love jellyfish but I’ve never had them together. I was pleasantly surprised at how well the textural elements worked together to present such a light, refreshing and lightly spiced dish. There was just enough rocket to give a bit of that nutty taste but did not overpower the dish at all. Overall a very balanced and delicious dish, especially for a hot day. 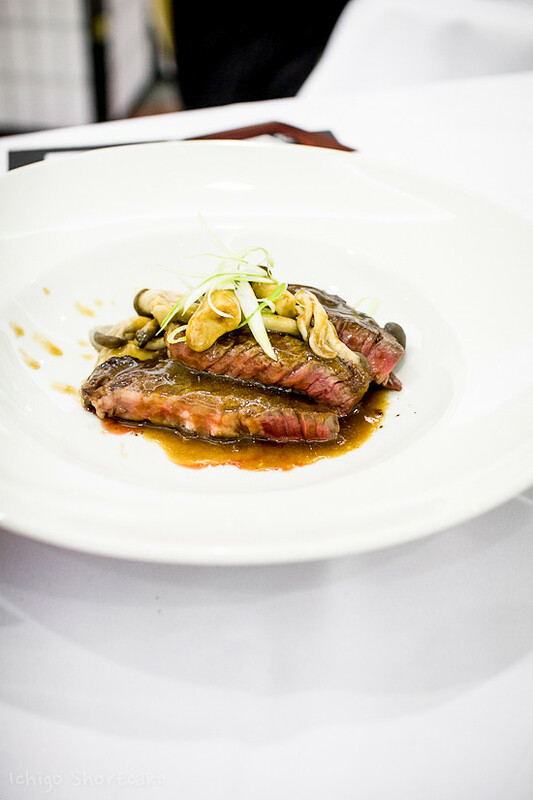 Now that James had successfully whet our appetites, it was time for our main – sher wagyu and Asian mushrooms with sake, soy and truffle oil. 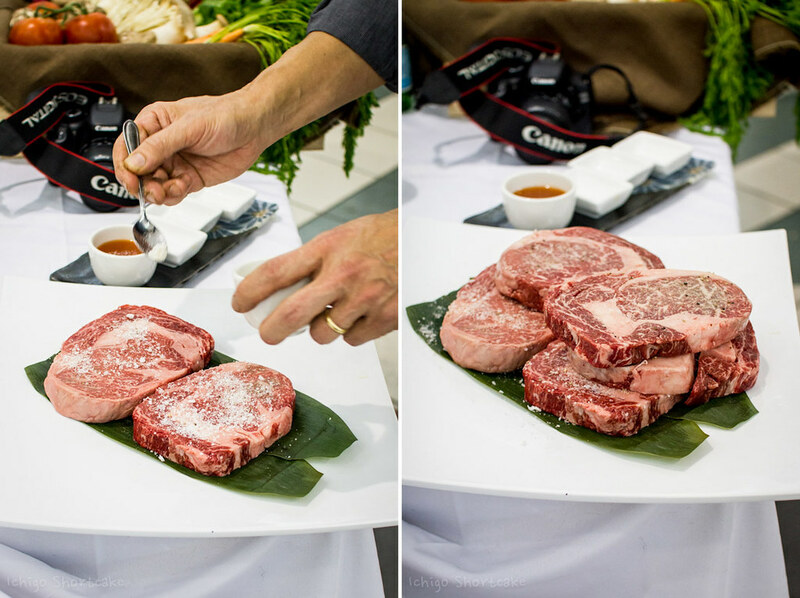 As James brought out the 5 pieces of huge and beautifully marbled wagyu, we were all in awe. 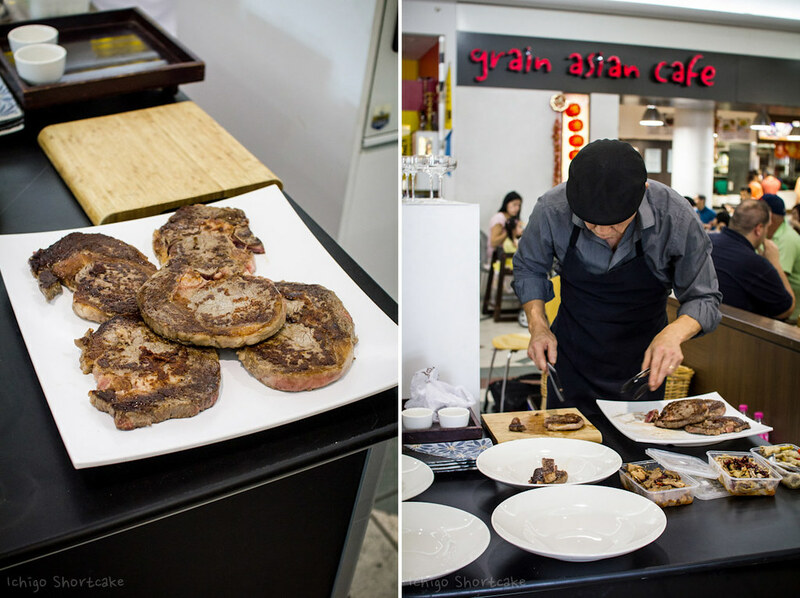 Yes I’ve cooked and eaten wagyu before but in that setting with our stomachs growling, it was an unbearable sight! I just wishes the wagyu would enter my stomach at that very instant. We eagerly waited for James to finish preparing the dish. Wagyu has beautiful taste on its own and is best seasoned well with salt and pepper before cooking to enhance the flavours. 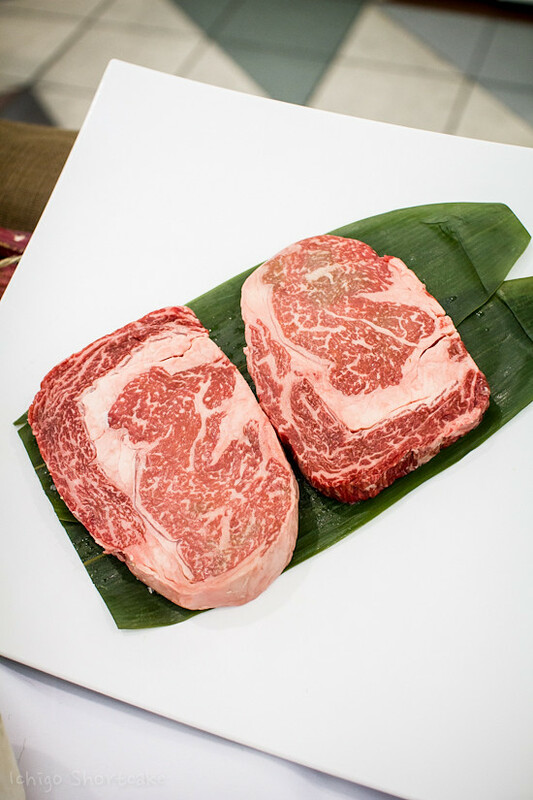 According to James, wagyu is best cooked at moderate heat to melt the fat into the flesh. 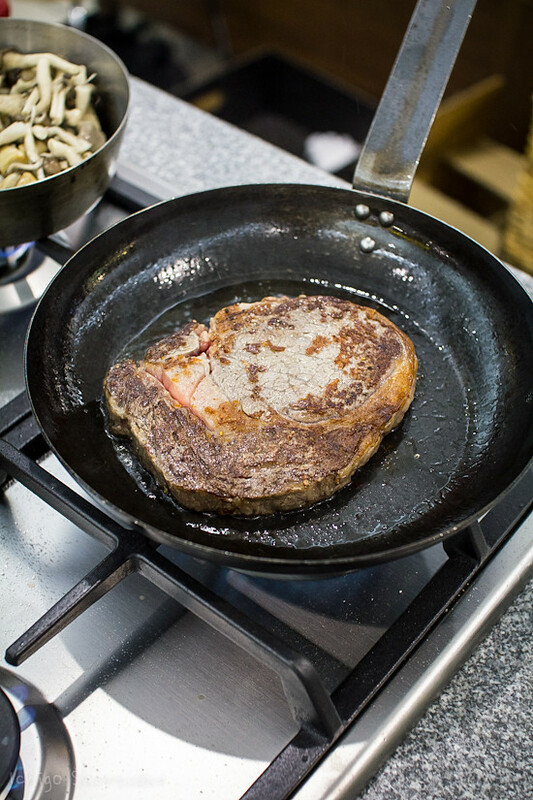 Very little oil is needed to cook wagyu due to its high fat content. These pieces were cooked for 2-2.5 minutes on each side until browned. It was allowed to rest for a few minutes before cutting. I was thinking to myself “seriously James, you’re doing this to tease us aren’t you?” but it was a necessary process to allow the meat to cook through. The dish was just superb. There was oohs and ahhs and mmms coming from beside me but all I could think about was the melt in my mouth, simple, earthy dish sitting in front of me. The meat was perfectly seasoned. I thought James may have put too much salt on but it was just right. The beef was in perfect harmony with the mushrooms and the rich earthy sauce which brought out the natural flavours of the meat. It was simple, but perfect and surprisingly very filling. I thought I could eat all 5 pieces of wagyu when I first laid eyes on them. Seriously. After such a good first 2 dishes, I didn’t think they could be beaten but James just kept surprising me. 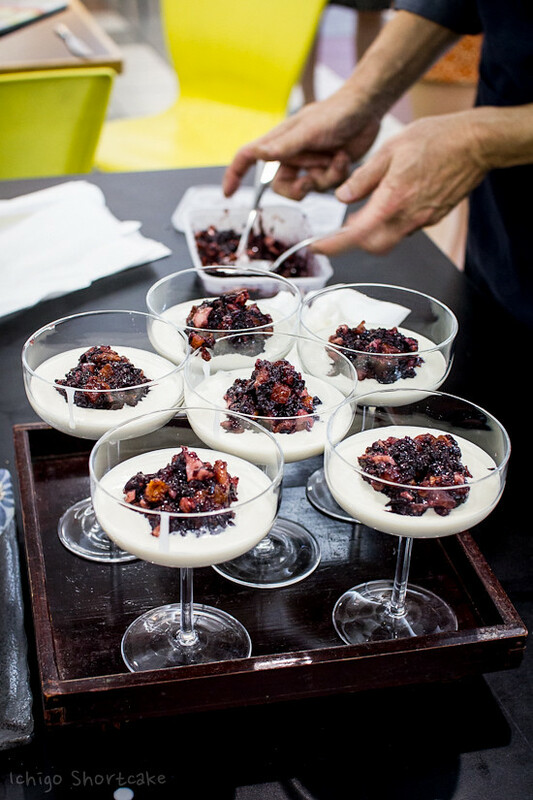 His signature dish – black rice pudding with glazed fruit and coconut anglaise – was the perfect finish to the lunch. This dessert was definitely not as heavy as it looks or sounds. I’m not sure just how many ingredients went into the black rice pudding but we tasted many things including light ginger, sour glazed fruits and of course the beautiful black rice. The sourness made it not as heavy and the coconut anglaise rounded the dish off very nicely. I wanted to lick the bowl clean but thought it wouldn’t look ladylike with so many people around. As James described, it was just like an Asian version of the Christmas pudding. But wait, there was more! 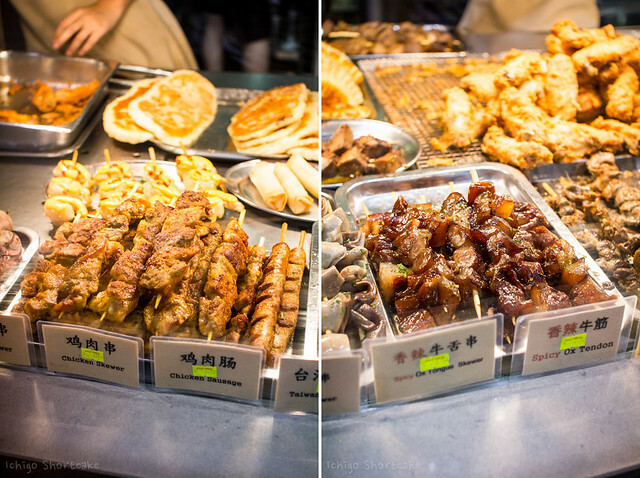 We had a sample of chicken feet, ox tongue and tripe from the Magic Cuisine store I mentioned earlier and they were fantastic. Lightly spicy and very tender, it makes these seemingly strange ingredients tasty even to people who don’t eat them everyday. The chicken feet were marinated in Chinese wine first which gives it a light alcoholic taste, mum makes this dish at home all the time so I was used to eating it. We were also provided with a tier of Chinese pastries which we were all a bit too full to eat but I did have a taste of each of them. They were soft and a bit sticky with tapioca and burnt sugar, coconut and even a slightly popcorn tasting green one (it was slightly salted). One of the best things about these blogger events is being able to meet the faces behind some of the blogs that I’ve been following since I started this blog. Sitting right next to me was Ashley from I’m So Hungree who does stunning photos. You’ll also be seeing a review about this great event on her blog in coming days! 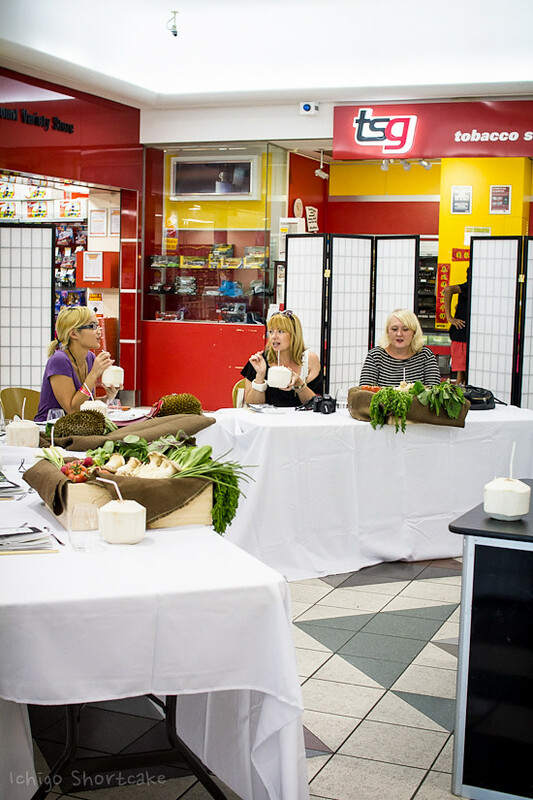 The Autumn tour is part of a series of Market Grazes to be run twice annually at Centro Box Hill and are registered through the CAE as short courses aimed at teaching people about Asian cuisine and its special ingredients and cooking techniques. 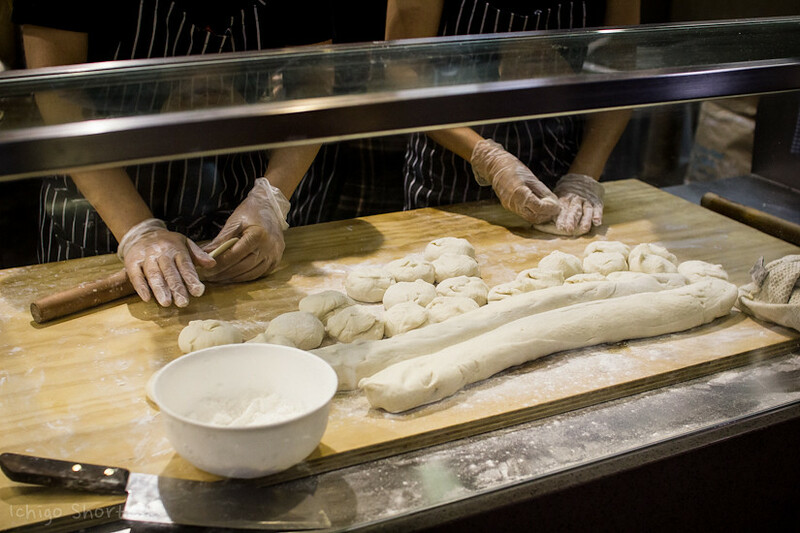 You’ll be able to meet store owners, pick up cooking tips along the way and sample foods from some of the market’s 20 retailers before sitting down to a lunch of handmade noodles and dumplings at Ra Ramen. You’ll also be given a bag of gourmet goodies at the end to take home and use in your own kitchen using some of the techniques that you will learn during the tour. As I mentioned earlier, the first tour is held tomorrow but unfortunately due to the heavy demand and popularity, tickets have all sold out! Not to worry though as the tour will be run again later in the year so please visit Centro Box Hill’s website for more details. If you’re interested in finding out what else is on during the Melbourne Food & Wine Festival, hop on over to their website at http://www.melbournefoodandwine.com.au. I know I’ve already talked a lot today but here’s an even more exciting thing I wanted to share with you. As part of the promotion for this event, the lovely people at PR Edge are giving away a $100 voucher to be used at any retailer in Centro Box Hill. 1. Comment below to let me know of an Asian ingredient that you want to try but haven’t yet had the chance (or guts to!). 2. Like me on Facebook if you haven’t done so already and let me know in your comment. This competition will run until 11:59pm EST next Friday 8th March 2013. Due to the nature of this competition, it’s only open to people who reside in Melbourne so please make sure you specify that as well. Please make sure you provide a valid email address as you will be contacted there if you are the lucky winner. Good luck my dear readers!! 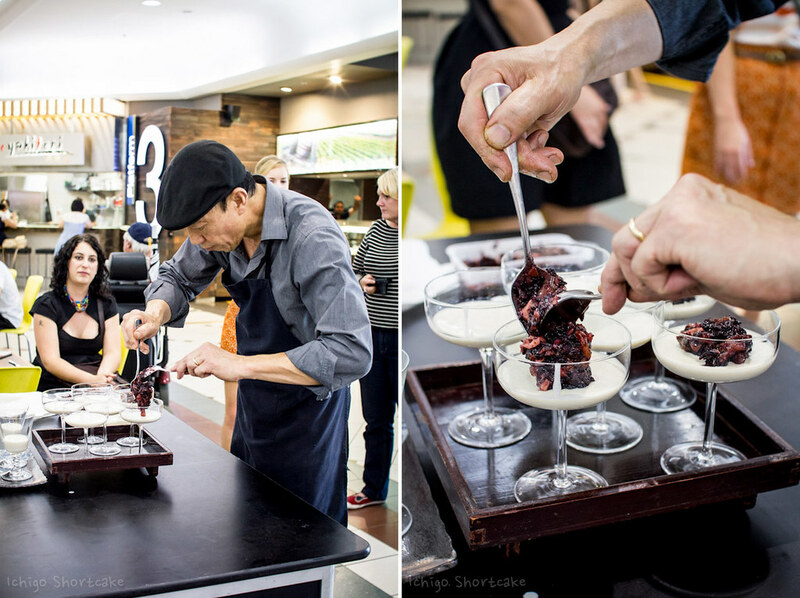 Disclaimer: Ichigo Shortcake dined at and toured Centro Box Hill courtesy of PR Edge, Centro Box Hill and the Melbourne Food and Wine Festival. I think I would like to try cooking with black chicken! I’ve eaten it before in herbal soups But never actually cooked it so I think that would be interesting to experiment with! Always wanted to try Durian just to see what it really tasted like. I like you on FB and am in Melbourne. What a great market! Thanks for sharing your lovely pictures with us. Dragon fruit, I wouldn’t even know where to begin preparing it! Do you cook it, peel it, what to do? I have no idea, but am intrigued and dying to try it. Century Eggs. I don’t think I’d have a problem with the supposed odour they give off, but don’t really know how or what to serve them with? Are they an item best eaten alone, or served with other items, and if so, what? And I’m a little bit worried they’d go through me, or give me food poisoning……….but intrigued all the same!! So no, I haven’t had the guts to try this one yet!! While not STRICTLY Asian, I’ve never had the guts to try mudcrab or lobster… After seeing them swimming around in the tanks then sectioned on a plate, it is all a bit too confronting for me! Liked on Facebook and living in Melbourne. Wow! 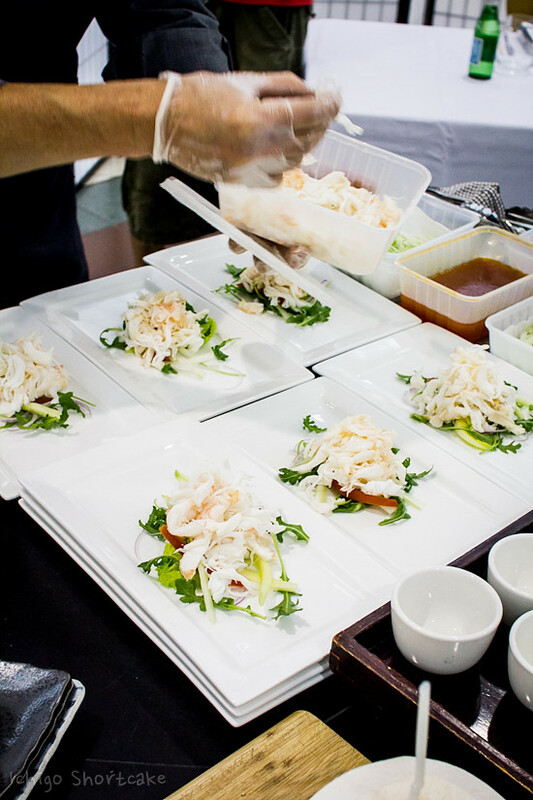 A two week Food and Wine festival…I would be in heaven! 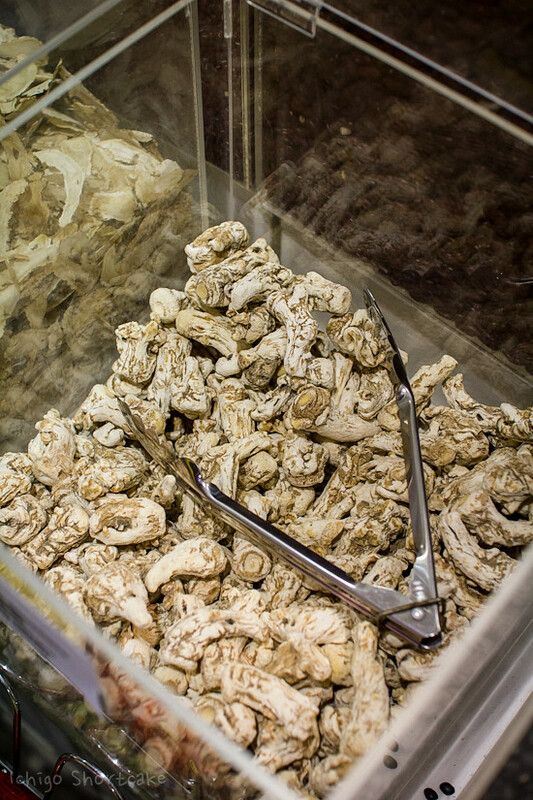 Your day looks wonderful…not sure about dried crocodile meat!! I would love to try wombok and make a delicious salad from it! What a great post and as always amazing photos! Thanks for the chance to win! Chicken feet, I haven’t had the guts, yet I’m happily eat all the other parts of the chicken!!! 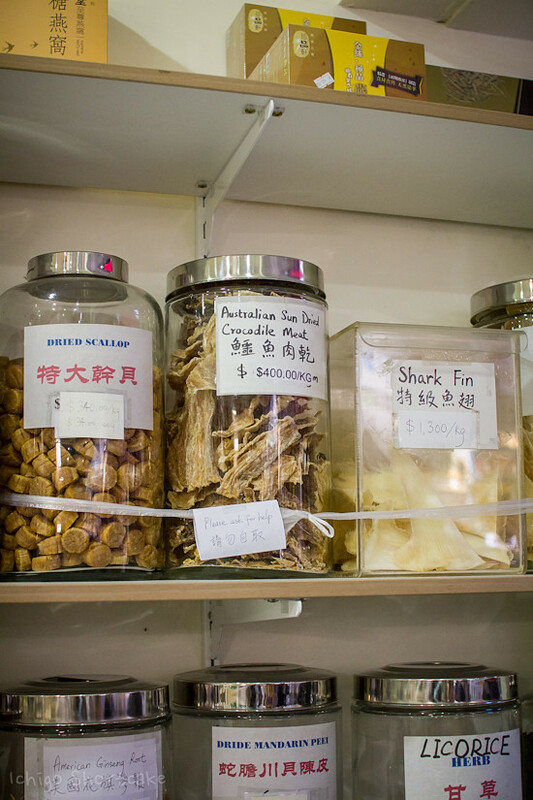 I don’t know why but the shark fin caught my eye! 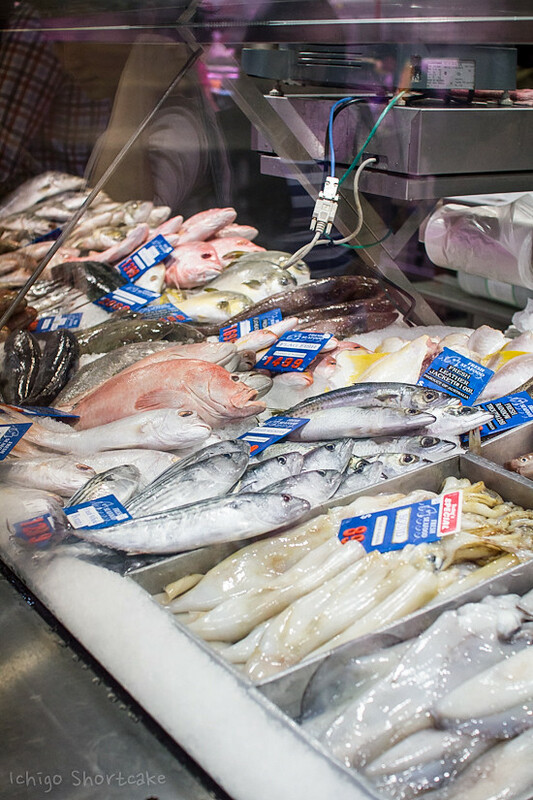 I love visiting markets and trying as much as I can of the food on offer. I do think I am fairly adventurous as there is not too much I haven’t tried. I loved all the food that was on offer at centro. So shattered to have missed this event (I was in QLD)! Looks like you had a wonderful time. I love Pancake Village but haven’t yet tried Rainbow Chicken, will need to do it next time! Century egg, I know it is very traditional but I can’t wrap my head around it. I love eating intestines and pig offal, but never had the guts or (clue) to cook them.. hahah.. I do so love Box Hill market! Thanks so much, I’m very excited!! !